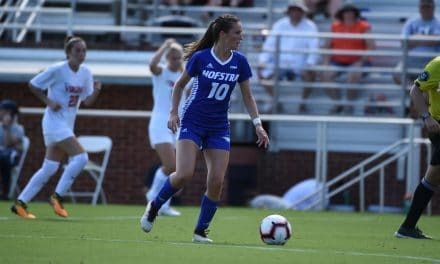 HEMPSTEAD, N.Y. – The Hofstra University women will take a five-game unbeaten streak into the weekend as they host Drexel University Thursday at 7 p.m. at Hofstra Soccer Stadium before heading to William & Mary College for a 2 p.m. matchup Sunday. The Pride (6-3-2, 2-0 Colonial Athletic Association) is 4-0-1 in its last five games, including opening CAA play with wins over Delaware and UNCW to sit atop the conference. Senior Kristin Desmond tallied twice in the 2-1 win over the Seahawks to lead the team and the league with six goals. Junior Jenn Buoncore had a goal and an assist on the weekend, setting up Desmond’s equalizer in the win over UNCW. Over its unbeaten run, Hofstra has allowed only one goal, with goalkeepers Jenna Borresen and Ashley Wilson teaming up for four consecutive shutouts before Sunday’s 2-1 victory over UNCW. Behind the goalkeeping tandem and a solid backline, the Pride boasts a league-leading 0.91 goals-against average. The Dragons (6-4-1, 1-0-1 CAA) enter the matchup on an unbeaten streak of their own, going 3-0-1 in their past four games, including tying Northeastern University and beating William & Mary College to open conference play. Vanessa Kara leads the team with nine points on four goals and an assist, while goalkeeper Christiana Ogunami boasts an .824 save percentage and 1.07 goals-against average. The Pride holds a 17-4 advantage in the all-time series with the Dragons, but Drexel registered a 3-0 win in Philadelphia last season. The Tribe (4-7, 0-2 CAA) will be looking to snap a seven-game skid this weekend after dropping its first two conference games to Drexel and James Madison University. William & Mary will host Charleston Thursday before the Pride comes to town. Sarah Segan leads the team with seven points on three goals and an assist. The all-time series between Hofstra and the Tribe stands at 11-6-2 in favor of William & Mary. The Tribe took last season’s meeting, 1-0, in Hempstead. Both games will be available via live stats and live video, with Thursday’s home game being broadcast through Pride Productions live video and audio. Links to game coverage can be found on this page and the Hofstra Women’s Soccer schedule page. The Pride heads to Towson a week from Thursday to continue conference play.